Having effective cyber security starts with understanding your cyber security risks. 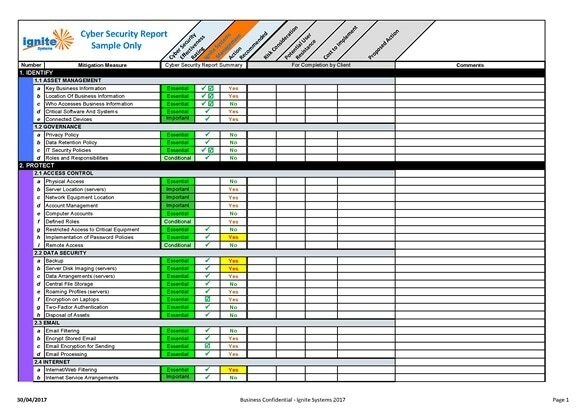 The Ignite Systems Cyber Security Risk Assessment involves an audit of a wide range of security mitigation measures consistent with the Ignite Systems Cyber Security Framework. The main objective of the Cyber Security Risk Assessment is to help an organisation improve its cyber security posture. The process involves an assessment of an organisation’s technology systems and related policies, procedures and arrangements, and provides a basis for an organisation to improve its cyber security risk profile. Traditional IT services focus on managing computers, and traditional IT security is not structured, skilled or experienced in dealing with the rapidly evolving threat landscape of today. Cyber Secure Management is much more than managing computers. Ignite delivers and manages a wide range of technology solutions specifically designed for small business. See more details here. People are an essential part of cyber security resilience. The final line of defence lies in the hands of end-users and the decisions they make. Educated staff can play an active role in creating a cyber security aware culture. As a recognised cyber security expert, Ian Bloomfield has delivered training to thousands of people and a wide range of organisations, including the Law Institute of Victoria, Australian Institute of Conveyancers (in Victoria & Tasmania) and the State Trustees. Training is tailored to suit the needs of the intended audience, such as a board of directors, senior management or the entire staff of an organisation. More general presentations on cyber security can also be provided and Ian has presented to conferences and special events involving audiences of 500+ people. See more details here.